, the following ingredients will not be accepted: salt, pepper, spirulina, honey, agave, garlic, cacao (the fruit is fine, but not the seed), chocolate, grains, nutritional yeast, oil, nama shoyu/tamari, seaweed and/or other "sea vegetables", vinegar, sauerkraut, or any other fermented food. This collection is only as good as the submissions it receives, so after you're done perusing, please share your own favorite recipes below. Need More Tasty Raw Salad Dressings In Your Life? 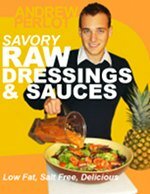 Sinfully delicious raw dressings can spice up your salad every night of the week. Don't worry, they're also low fat and incredibly healthy. Banana and Dill Dip W/ Celery Sticks. Tell Us About a Raw Food Recipe You Love. Every raw foodist I know has at least one mouth-watering recipe they've concocted up in their kitchens. These recipes help new raw foodists get grounded and give the experienced something to experiment with. Please submit your best recipe along with a photo below. No salt, processed foods, oil or harsh spices like pepper please. Ingredients: * 1 Pineapple * 6 Pears * Juice of 1 Coconut Instructions: Blend all ingredients together.